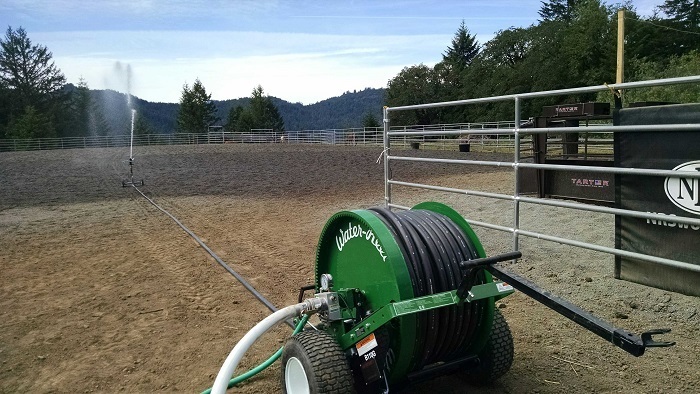 ARENA DUST CONTROL AND FOOTING IMPROVEMENT FOR RIDING ARENAS USING RETRACTABLE REEL TRAVELING SPRINKLER SYSTEMS FROM SMITH IRRIGATION EQUIPMENT OFFERS THE ABSOLUTE BEST SOLUTION FOR SUPPRESSION OF FUGITIVE DUST WITH WATER APPLICATION. 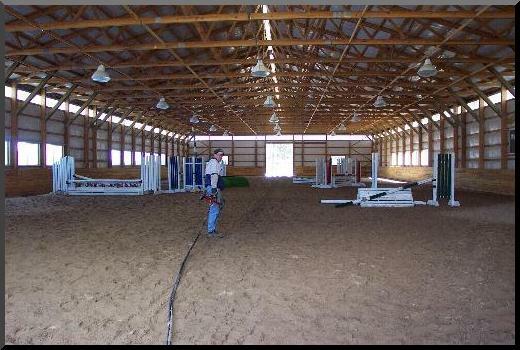 See just how "easy" Arena Dust Control is with an automatic retractable traveling sprinkler system from Smith Irrigation Equipment. 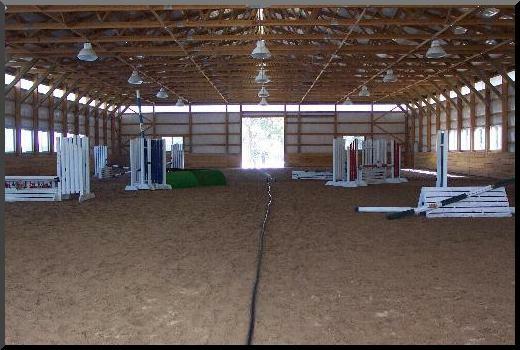 We can help you choose the right model for the job based on your arena size, available water supply, desired performance level, and your own budget considerations. 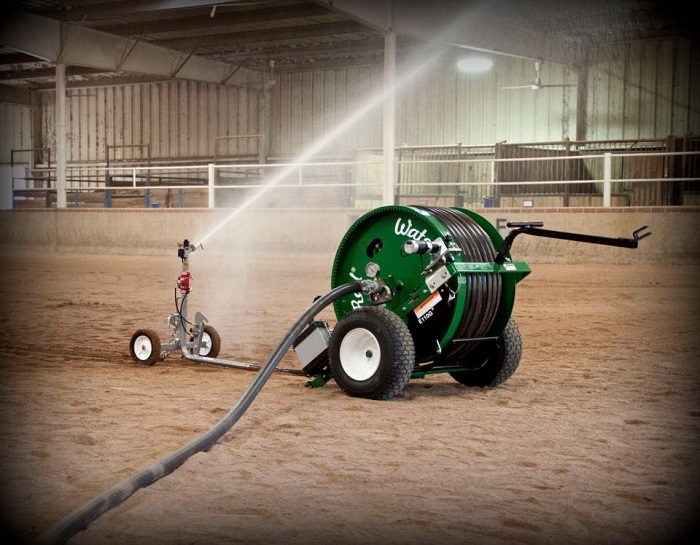 We have models that can operate from a garden hose supply or larger high volume water sources. Our new electric battery and solar powered reels set new standards for convenience and performance while decreasing maintenance. Please give us a call to discuss your conditions and needs. We will give you straight answers on what to expect from our equipment. "EXCERPT REPRINTED FROM THE NORTHEAST EQUINE JOURNAL"
A WORD OF CAUTION ABOUT DUST CONTROL. WHILE MORE AND MORE PRODUCTS ARE BECOMING AVAILABLE TO COPE WITH THIS PROBLEM, SOME OF THEM CAN ACTUALLY MAKE YOUR SURFACE MATERIAL COMPACT AND LOSE ITS SPRING SOONER. "THE BEST PRODUCT FOR CONTROLLING DUST IS STILL WATER." MAINTAINING A MOISTURE CONTENT OF 8-12% CAN KEEP DUST TO A MINIMUM, KEEP YOUR FOOTING SPRINGY, AND KEEP GOOD TRACTION. 1. POSITION REEL AT THE END OF THE ARENA AND CONNECTION TO PRESSURIZED WATER SUPPLY. 2. PULL THE SPRINKLER AND CART TO THE OPPOSITE END OF THE ARENA. 3. TURN THE WATER ON AND SET THE RETRACTION TRAVEL SPEED FOR THE DESIRE WATER DEPTH. 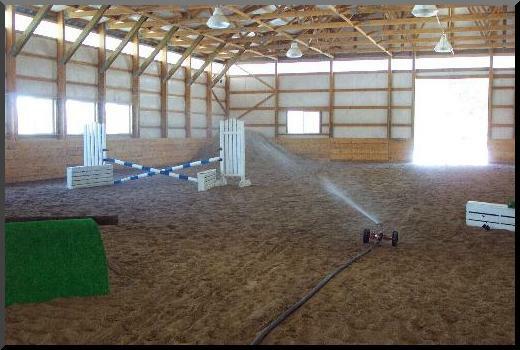 THE SPRINKLER COVERS THE ARENA IN THE DESIRED WATER DEPTH AND SHUTS OFF AUTOMATICALLY. CALL: 877-488-3270 TOLL-FREE OR EMAIL US AT: SMITHIRR@RURALTEL.NET THANK YOU. QUESTIONS? "CALL 877-488-3270 TOLL FREE OR CLICK HERE TO EMAIL US."